NEFF C1AMG83N0B Built-in Combination Microwave - Stainless Steel. Kitchen Appliances > Built-in Appliances > Built-in microwaves. Brand new & pristine product. Top features: - Hotair delivers even heat distribution for perfect results - Auto-cook programmes eliminate the worry of cooking with microwave - Large capacity lets you cook for the whole family in one go Hotair Make mealtimes easier with the Neff C1AMG83N0B Built-in Combination Microwave. With its stylish design and host of functions, it fits right in with your kitchen. You'll find baking a lot simpler and tastier with Hotair. This oven function distributes hot air evenly around the cavity, ensuring great results every time you bake. Make crispy baguettes, light and fluffy cakes, and much more using your microwave, thanks to Hotair and inverter technology. Auto-cook programmes Waiting for the ideal moment to remove food from the microwave can be just as stressful as cooking from scratch. That's why the Neff C1AMG83N0B has a host of auto-cook programmes, giving you the peace of mind that your food is definitely ready when the microwave is done. Sit back, relax, and let your microwave take care of dinner. Large capacity There's no need to portion meals before they're cooked due to microwave size restrictions. This Microwave Oven boasts a large 44 litre capacity, letting you cook whatever you like for your whole family without limitations. That means that when you're back from work and the kids are home from school, supper's ready at the same time for everyone. More options with accessories Liven up your microwave cooking with our range of microwave-safe accessories. Whether you need to warm up your soup for lunch or steam rice and vegetables for dinner, you'll find something to help you create exciting meals in your microwave. All Currys/PC World Outlet guarantees are non-transferable. Maximum microwave power: 900 W. Oven temperature: up to 230°C. Retractable sword dial and touch control. Auto cooking programs: 11 auto cook programs, including:, Rice, Potatoes, Vegetables, Bake, frozen, Chicken, while, Sirloin, medium, Pork neck joint, Lamb, medium, Meat loaf, Fish, whole, Rice stew with fresh ingredients. Auto defrost programs: 4 auto defrost programs, including:, Minced meat, Pieces of meat, Chicken pieces, Bread. Number of power levels: 5. Maximum countdown on timer: 90 minutes. Professional installation: Please note this product should be installed by a qualified engineer, such as one of our Team Knowhow experts. Door hinge location: Drop down door. 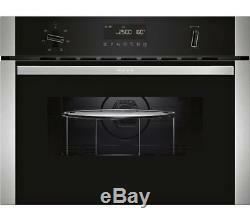 Cord length: 1.8 m. Box contents: Neff C1AMG83N0B Built-in Combination Microwave, Grid high x 1, Grid flat x 1, Turntable x 1. Internal dimensions: 250 x 420 x 420 mm (H x W x D). External dimensions: 454 x 594 x 570 mm (H x W x D). This product has no reviews yet, however see what our buyers say about our other products.. Small box electricals like computers, tablets, camera's, small kitchen appliances. We deliver within the UK only. We don't post to Channel Islands or Internationally. Warehouse/store pick-ups are not available. For more information, read on.. Courier selection is standard and will depend upon value and/or weight/dimensions of the product. This excludes the Channel Islands and BFPO. To create your return label. Unopened - in an as new condition - unused, without installation or data input - in the same condition as supplied to you - complete with any accessories and free gifts offered with it - with the original box and unopened packaging. Unwanted products cannot be accepted after 30 days if any of the above criteria are not met. The right of cancellation does not apply in the following circumstances. When the product seal has been broken on any DVDs, CDs, memory cards or software, including games - On any personal hygiene products such as shavers, hair care products - On headphones, where the seal on the packaging is broken - If you want to return a Software Product Activation Key card which is not faulty, the silver strip on the back of the card must be fully intact as new. Complete the Reason for Return note that came with your parcel & include it in the parcel with your return. Take your parcel into any Post Office. To find your nearest Post Office. Remember to ask for a proof of return receipt from your Post Office as this will act as proof of posting should the parcel go astray. Failure to obtain this may prevent us from refunding you if your return is not received by us. Your return can be tracked using the tracking reference from your proof of return receipt by clicking Track My Return. In the same condition as supplied to you - complete with any accessories and free gifts offered with it - if possible, with the original box and packaging. The above warranties do not cover non-faulty products, nor issues caused by accident, neglect, misuse or normal wear and tear. The item "NEFF C1AMG83N0B Built-in Combination Microwave Stainless Steel" is in sale since Thursday, May 10, 2018. This item is in the category "Home, Furniture & DIY\Appliances\Small Kitchen Appliances\Microwaves".